Vasquez Rocks is a Natural Area Park located near Agua Dulce, CA in between Santa Clarita and Palmdale. The park houses rock formations created over thousands of years by the movement of the San Andreas Fault line. Vasquez Rocks got their name during 1873-1874 when the outlaw Tiburcio Vasquez used the rock formation to elude capture by the authorities. Many famous movies and television shows have been shot there, such as Star Trek, Planet of the Apes, The Flintsones, Austin Powers, Fear Factor, CSI, The Twilight Zone and many more. 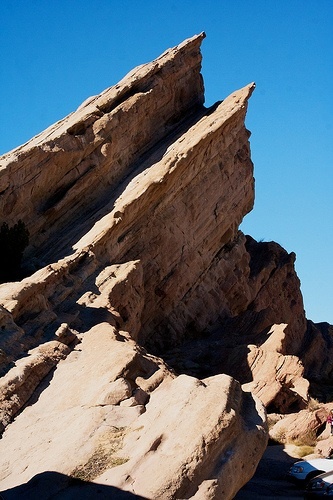 Currently, many visitors flock to Vasquez Rocks yearly to see the majestic formations created by the San Andreas fault and to celebrate holidays. Sometimes, those who come to see the rocks find themselves on the wrong side of the law for any number of reasons. If someone you know or love has been arrested in or around the Vasquez Rocks area, call SCV Bail Bonds immediately for a free consultation and to get the bail bond application process started. We can be reached locally at 661-299-2245 or toll-free at 877-4-BAIL-911. Individuals arrested in or around Vasquez Rocks will be taken for booking and processing to the Palmdale Sheriff Station. The station has a jail on-site, and booking and processing can take from 2 to 6 hours. Booking and processing is the procedure in which fingerprints and mug shots are taken and a nationwide background check is conducted. Once the process is complete bail is set for those who are eligible. Sometimes, inmates will be transferred to Men’s Central Jail in Los Angeles or Lynwood Jail (for women). If an inmate is transferred to one of the larger, busier facilities, it can take an additional 24 hours (or longer) to bail them out due to the busyness of the jail. As such, it is important to get the bail bond process started as soon as possible in order to avoid the potential transfer and increased time in custody. It is not required that you personally appear at the jail in order to bail someone out. The process begins by calling us and speaking with a licensed bail bondsman and answering a few short questions. We have the technology available to communicate with the jail and proceed with the bail bond process without you setting foot outside your own home. However, if you would rather travel to our local office, or the jail facility, we are happy to meet you there. In the State of California, the cost of a bail bond is 10% of the total bail amount. Therefore, if bail is set at $15,000, the cost of a bail bond will not exceed $1,500. There are several methods in which a bail bond can be paid for. Credit cards such as American Express, Visa, Master Card and Discover are accepted as well as cash, personal or business check, money order, money wire transfer or bank account transfer. Paying for a bail bond is not always something one expects to need to do, therefore we at SCV Bail Bonds offer several creative financing solutions to fit any and all budgets. Finding out someone you know or love has been arrested can be a shock, and wanting to get them out of jail as quickly as possible can be stressful. We are here 24/7 to make the process smooth and easy. For Vasquez Rocks bail bonds information call us any time to speak with a licensed, professional bail bondsman at 661-299-2245 or 877-4-BAIL-911 (4591). You never have to go through this alone.